the dti invites you to submit your application to participate and showcase your products at the World Food Moscow fair, from 24 to 27 September 2019 in Moscow, Russia. The deadline date for the submission of complete National Pavilion application forms is 17 April 2019. The Department of Trade and Industry (the dti), extends an invitation to companies with defence-related products to apply to participate at the DSEI 2019 Exhibition, which is scheduled to take place from 10 to 13 September 2019. The deadline for submission of complete National Pavilion application form accompanied by all supporting documentation is 10 April 2019. 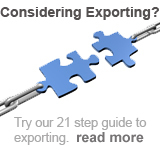 Whether you're an exporter or not are you looking for a freight forwarder? A searchable database can be found here. Thedti's National Pavilion List 2017/2018 is now available. Click here. Here's a popular export question. Do you know the answer? What is the difference between using the Incoterm CPT as opposed to DAP: what are the advantages and disadvantages – and is there a price difference? Do you need the information from Trade Map but don’t have the time or inclination to do it yourself? No problem, we at ExportHelp will compile a report for you for four countries of your choice based on the Trade Map data for as little as R995 excluding VAT. We simply need to know what the HS codes are for the products that you plan to export and the countries you are interested in and we will then compile the report for you. Export Councils have been established to promote selected industry sectors. Here we focus on theSouth Africa Fruit and Vegetable Canners Association (SAFVCA). The SAFVCA, a key Export Council, oversees the processing of more than 600 000 tons of fresh fruit, tomatoes and vegetables annually by the association's members. These are sourced from 1 500 farms and generate sales of nearly R5.0 billion. Members directly employ nearly 12 000 workers and 532 administrative and sales staff. Approximately 85% of canned Apriduous fruit and pineapple products are exported every year. To learn more about what the SAFVCA does and what it offers its members click here.